Tomb Raider 3 + dgVoodo (+Reshade) = everything white Oo any suggestions? Weird... TR3 works for me. 1. Try to launch TR3 with the -setup option (TR3.exe -setup) to reconfigure your graphics settings. 2. If it still doesn't work then could you plz post me a debug-log using the spec-release version of dgVoodoo? Not broken at all - you enabled 8bit textures in configuration and dgVoodoo is not supporting them properly - so no textures at all. Use ATI card in Control Panel, it disables 8bit texture support and game will not enable them at all. Indeed... 8 bit textures. 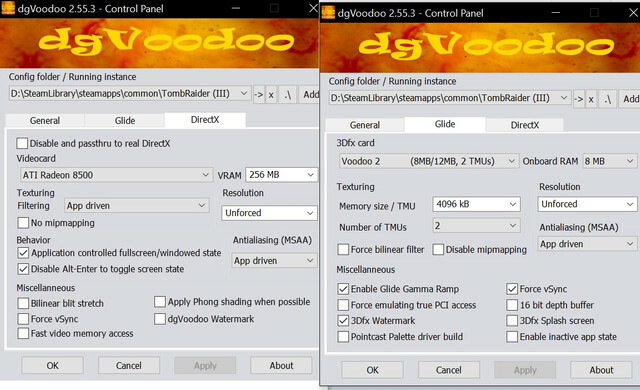 Now I remember I was investigating that some time ago but as far as I remember I didn't found problem on dgVoodoo side. i got the same problem, but 8 bit is turned off. if i turn 8bit on the texturs are black.. what do i miss? Could you plz post a screenshot of your TR3 graphics settings dialog? i changed die card to an ati but that didn`t help.